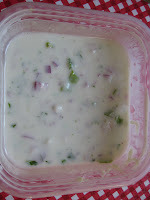 Well we all make raita with onion or with cucumber. We commonly call it Thayir pachadi. I make cucmber thayir pachadi very often during this summer season. We had a chance to eat cucumber thayir pachadi with a little twist, couple of months back. We had a trip to Eshwari Akka's house and she made this pachadi that time. It was really tasty and i wanted to try this today as a side dish for bisibelebath. Shred the cucumber, chop the onion. Take 1/4th quantity of cucumber, add rosemary, basil leaf in a mixie and grind it finely. You will get a light green color paste. Now add it to the chopped onion, add the yogurt and required amount of salt. Mix it well. Serve it with any variety rice. It will definitely be refreshing. Usually people used to season the thayir pachadi which i won't do it. If you want, you can season it with mustard seeds. good flavours in the pacchadi..
Nice addition of rosemary and basil. Nice flavours in the raitha. @Asha - Lucky you Asha, I bought from the store..
@ Ashwini - thanks Ashwini..
@ Sripriya - Thanks dear..
rosemary n basil! This is a must try..so refreshing! spinach - Leftover special Side dish.